On a red-horizoned higher world, a man with a Monitor’s haircut is defeating a colossus styled on Superman. 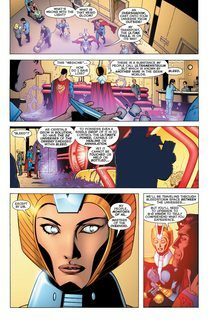 The Monitor-creature gloats that he can hear “her final heartbeat” – the sound of Superman failing. 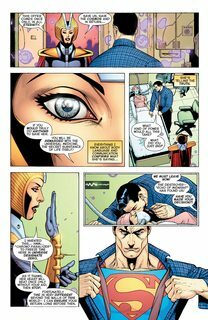 In Metropolis Memorial Hospital, Clark Kent is at his wife’s bedside. 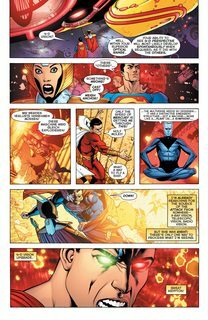 As he remarks that he would give “anything” to save her, time stops and he is visited by the Monitor Zillo Valla who offers him a pact – if Superman will help her, she will save Lois Lane’s life; if he refuses, all of existence will be destroyed. However, he must choose quickly – she is being stalked by the destroyer Echo of Midnight. As they leave, Superman notes that Earth without time is in perpetual twilight – a shadow has fallen accross creation from outside.